Last year, I wrote about the Nevada lawsuit involving a dispute about use of the name Tropicana in connection with the famed Tropicana Resort & Casino in Las Vegas (link here). Pamela Chestek – well known for her many blog posts regarding convoluted assignments and related transactions with respect to intellectual property – provided her own unique insights into the matter around the same time (link here). What started out as a simple declaratory judgment action by the new owners of the Tropicana Las Vegas regarding their long-time right to use the name Tropicana in connection with the hotel/casino located at the intersection of Las Vegas Blvd. and Tropicana Avenue has recently expanded into a fight over actual ownership of the TROPICANA trademark. While the Las Vegas Sun published an succinct article last week (link here) regarding the lawsuit filed in Delaware Bankruptcy Court by a group of companies lead by Carl Icahn's Tropicana Entertainment Inc. (a copy of the complaint can be downloaded here), the actual factual circumstances giving rise to the instant dispute regarding ownership of the TROPICANA mark are interesting enough (and so amazingly convoluted) that I felt a more detailed discussion of the facts underlying the ownership dispute was merited – if anything to provide another illustration of how trademark rights are handled in the course of multiple large scale corporate transactions (including bankruptcy proceedings) and how certain things can (and indeed do) fall through the cracks. The story begins back in 1957 when the Tropicana hotel and casino first opened in Las Vegas (the “Tropicana Las Vegas”). The Tropicana Las Vegas was originally operated by a company named Hotel Conquistador, Inc. (“Conquistador”) on land that was owned by the Jaffe Family (“Jaffe Group”). Under the terms of a 1972 lease agreement between Conquistador and the Jaffe Group, Conquistador was required to transfer to the Jaffe Group whatever right it had, if any, in the “Tropicana” name after the termination of the lease. Later, in 1977, the Jaffe Group formed a partnership with Edward and Fred Doumani (the “Doumanis”) named Tropicana Enterprises which succeeded the Jaffe Group as the lessor in the lease agreement with Conquistador. On June 26, 1979, a company named Hotel Ramada of Nevada, a subsidiary of Ramada Inns, Inc., acquired from Conquistador the land lease of the Tropicana Las Vegas and the right to use the “Tropicana” name. 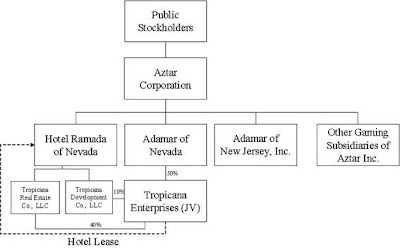 Then on July 25, 1979, the Doumanis sold their 50% interest in Tropicana Enterprises to Adamar of Nevada Inc. (“Adamar of Nevada”), also a subsidiary of Ramada Inns, Inc. 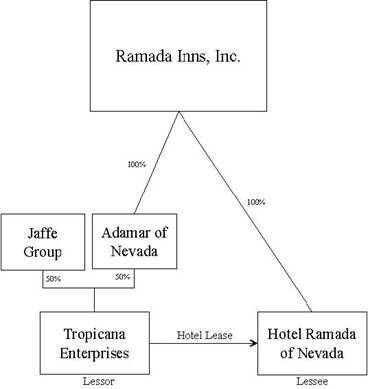 In September 1980, Tropicana Enterprises entered into the so-called 1980 Trade Name Agreement with Ramada Inns, Inc., the Jaffe Group, Hotel Ramada of Nevada, and Adamar of New Jersey, Inc (another wholly owned subsidiary of Ramada Inns, Inc.). This agreement authorized Ramada Inns, Inc. to file federal trademark registrations in its name for the “TROPICANA” mark, but also required that proof of such registrations be provided to the Jaffe Group. Ramada Inns, Inc. did subsequently register several trademarks with the U.S. Patent and Trademark Office including, among others, the mark TROP and TROPICANA (the “Tropicana Trademarks”). In 1989, Ramada, Inc. (formerly named Ramada Inns, Inc.) decided to spin off its gaming assets and properties into a newly formed subsidiary, Aztar Corporation (“Aztar”). As part of the spinoff, on December 20, 1989, Aztar, Ramada Inc., Hotel Ramada of Nevada, Adamar of New Jersey, Inc., Tropicana Enterprises, the Jaffe Group, and a company named TROP C.C. entered into a Trade Name Agreement Assignment, Guaranty, and Agreement (the “1989 Agreement”) whereby all of the Ramada parties’ rights under the 1980 Trade Name Agreement were assigned to Aztar and Ramada was obligated to transfer to Aztar all of Ramada’s trademark registrations with respect to the “Tropicana” name (which Ramada subsequently did). The situation then becomes a little more convoluted. 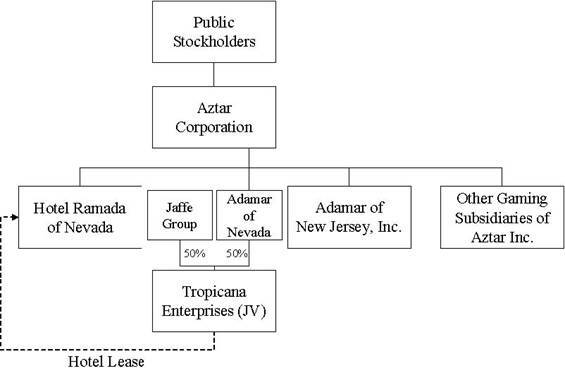 According to the Delaware complaint, on February 1, 2002, Aztar caused Adamar of Nevada to purchase the Jaffe Group’s 50% interest in Tropicana Enterprises, thereby causing Aztar to become the “beneficial owner” of the equity interests in Tropicana Enterprises. However, even the corporate chart provided in the Delaware complaint shows that what apparently really happened is that the Jaffe Group’s 50% partnership interest in Tropicana Enterprises was divided and transferred to two newly formed companies, Tropicana Real Estate Co., LLC (acquiring a 40% interest in Tropicana Enterprises) and Tropicana Development Co., LLC (acquiring the remaining 10% interest in Tropicana Enterprises). Both of these new companies were wholly owned by Hotel Ramada of Nevada, which in turn was wholly owned by Aztar. One other complicating factor was that also in 2002, Tropicana Enterprises and Hotel Ramada of Nevada entered into an amended lease agreement that expressly terminated the prior land lease and contemporaneously effectuated a new land lease; however, the amended lease agreement failed to reference the 1980 Trade Name Agreement or address whether the reversionary provision of the 1980 Trade Name Agreement was terminated. While this new lease effectively triggered the reversion under the 1980 Trade Name Agreement (there was never any express consent to the termination of the reversionary interest obtained from the entities which held the reversionary interest), there was never any demand for the transfer of the rights to the trade name made by the entities which held the reversionary interest. Nonetheless, the “extinguishment” of the contingent assignment right from the 1980 Trade Name Agreement was expressly mentioned in subsequent SEC filings by Aztar. Later, in 2004, as part of a loan transaction pledging Aztar’s assets as collateral, Aztar entered into an Amended and Restated Trademark and Collateral Agreement with Bank of America (as administrative agent) which represented that Aztar owned the Tropicana Trademarks. As noted in the Delaware complaint, this particular agreement was signed by the all of the signatories to the 1980 Trade Name Agreement, or their successors-in-interest, with the exception of the Jaffe Group. On May 19, 2006, a company named Wimar Tahoe Corporation purchased Aztar for $2.1 billion – structured so that Aztar became a subsidiary of a newly formed company named Wimar OpCo LLC, which was later renamed Tropicana Entertainment, LLC, and became the holding company for the acquired assets, which based on representations by Aztar in the purchase agreement included the Tropicana Trademarks. However, the way the Wimar-Aztar purchase was structured is where it starts to get even more convoluted. The $2.1 billion purchase of Aztar was financed through two separate credit facilities – what are generally described as the OpCo Credit Facility (for the so-called OpCo Debtors) and the LandCo Credit Facility (for the so-called LandCo Debtors). The LandCo Debtors were those entities involved in the ownership and operation of the Tropicana Hotel and Casino in Las Vegas, Nevada; and the OpCo Debtors were those entities involved the operation of the Tropicana Casino & Resort Atlantic City in New Jersey, the Tropicana Express in Laughlin, Nevada, and other casinos. As part of the OpCo Credit Facility transaction (which consisted of a $1.53 billion secured term loan and a $180 million secured revolver), the OpCo Debtors pledged as collateral any and all trademark assets they owned. One of the schedules of trademark assets pledged included Aztar’s ownership of the Tropicana Trademarks, which were to be pledged as security to the OpCo Lenders. On September 12, 2007, Aztar executed a written assignment of its interest in the Tropicana Trademarks to Tropicana Entertainment, LLC, which subsequently pledged such trademarks to the OpCo Lenders under the OpCo Credit Facility. As part of the LandCo Credit Facility, the LandCo Debtors were also required to identify any trademarks owned. None of the LandCo Debtors identified any ownership or contingent interest in the Tropicana Trademarks. The Delaware complaint argues that the representations made by the relevant parties as part of this financing transaction shows the clear understanding of all parties involved – i.e., that the Tropicana Trademarks were owned unconditionally by Aztar at that time. Moreover, all of the secured financing provided under the credit facilities were loaned in reliance upon the representations made with respect to the Tropicana Trademarks. Of course, like so many companies in the mid-2000s who engaged in large scale secured debt financing only to find themselves unable to make debt payments when the economy tanked in 2008, Tropicana Entertainment, LLC filed for bankruptcy in Delaware Bankruptcy Court on May 5, 2008. On May 30, 2008, the Court entered a Cash Collateral Order which provided that the Liens acquired by the OpCo Lenders under the OpCo Credit Facility were “valid, binding, perfected, enforceable, first priority liens on the personal and real property described in the” OpCo Credit Facility, which included Tropicana Entertainment, LLC’s ownership interest in the Tropicana Trademarks. Moreover, there was no challenge against the Court’s Order regarding the OpCo Lenders’ liens lodged by any party during the 90 day challenge period. The court’s Order also stated that no grant of security under the OpCo Credit Facility “shall be stayed, restrained, voidable or recoverable . . . , or subject to any defense, reduction, setoff, recoupment or counterclaim” after the challenge period, that the LandCo and OpCo Debtors waived and released the OpCo agent and OpCo Lenders from any and all claims arising out of the OpCo Credit Facility, including the extent, validity, priority and perfection of liens in the Tropicana Trademarks, and that that any other party-­in­-interest’s claims against the OpCo Credit Facility agent and the OpCo Lenders would be forever relinquished, released and waived after the expiration of the 90 ­day challenge period. On July 7, 2008, the OpCo and LandCo Debtors each filed separate schedules of their assets and liabilities. Tropicana Entertainment, LLC filed schedules of assets and liabilities that listed the Tropicana Trademarks as assets; the LandCo Debtors’ schedules, on the other hand, did not assert any interest, ownership or otherwise, in the Tropicana Trademarks. The so-called OpCo Exit Facility Lenders (the designated post-bankruptcy lenders to the post-bankruptcy debtors of the OpCo assets) pledged an additional $150 million loan to the OpCo Debtors to help the OpCo Debtors reorganize – a loan based in part on the pledging of the Tropicana Trademarks as security for the loan. In contrast, the LandCo Lenders acquired interests in the $440 million LandCo secured term loan under the LandCo Credit Facility without any reliance on the Tropicana Trademarks as security. With insufficient assets available to satisfy the secured obligations under the OpCo Credit Facility and the LandCo Credit Facility [ed.-big surprise], the decision was made to file two separate plans of reorganization -- the LandCo Plan concerned only the Tropicana Las Vegas and the OpCo Plan concerned all of the remaining casino properties which were part of the bankruptcy reorganization. Both plans provided that the respective secured lenders would take equity and management interest in the reorganized OpCo and LandCo debtors and that following bankruptcy, the reorganized OpCo and LandCo entities would operate as separate enterprises. This decision to separate the two companies into distinctive and separate enterprise is what set up the eventual dispute over the rights to the Tropicana name because before bankruptcy, the Tropicana Las Vegas was part of one big happy corporate family and used the Tropicana name without having to pay any royalty; however, post-bankruptcy, Tropicana Las Vegas would be a separate company that the OpCo entities would no longer be able to control with respect to usage of the Tropicana Trademarks and the quality control related thereto. During negotiations regarding the OpCo and LandCo plans, the OpCo Debtors advised the LandCo Lenders that the Reorganized LandCo Debtors (i.e., the LandCo Debtors after the reorganization) would need to obtain a license from the Reorganized OpCo Debtors to use the Tropicana Trademarks after the plans became effective. Understandably, the LandCo Lenders – in particular Onex Corporation, the largest secured lender under the LandCo Credit Facility – rejected the idea of paying any license fees for use of the Tropicana Trademarks and countered with a request to use the Tropicana Trademarks for free, in perpetuity, and without control of such use of the trademarks by the Reorganized OpCo Debtors – an idea that the OpCo Debtors rejected. In order to allow the reorganizations to move forward, the parties agreed to postpone the dispute over a royalty payment for the Tropicana Trademarks. The Delaware complaint describes the understanding of the parties as one which recognized “that the OpCo Debtors owned the Tropicana Trademarks but that the LandCo Debtors may or may not have had a right to use the Tropicana Trademarks, and if so, could they use it without paying a royalty” but which said nothing about ownership or which challenged the Court’s original order. On May 5, 2009, the Delaware Court issued its Confirmation Order for the OpCo Plan, which went into effect on March 8, 2010. The Order approved the OpCo Exit Facility and held that the OpCo Exit Facility Lender liens were “valid, binding, perfected and enforceable liens and security interests in the real and personal property described in the OpCo Exit Facility and its attendant documents” and that such liens “shall not be subject to avoidance, recharacterization, recovery, subordination, attack, offset, counterclaim, defense or ‘claim’ . . . of any kind under any Applicable Laws as of the Effective Date.” On May 5, 2009, the Delaware Court also issued its Confirmation Order for the LandCo Plan, which went into effect on July 1, 2009, and did not include any claim to any kind of ownership interest in the Tropicana Trademarks. On July 20, 2009, two of the Reorganized LandCo Debtors, Tropicana Las Vegas, Inc. and Hotel Ramada of Nevada, LLC (together “Tropicana LV”), filed a lawsuit in Clark County District Court in Las Vegas, Nevada (previously mentioned above) seeking a declaration that they have a right to use the Tropicana Trademarks in connection with the Las Vegas resort and casino property without control by or payment to the OpCo Debtors. See Tropicana Las Vegas, Inc., et al. v. Aztar Corporation, et al., Case No. A09595469­B (Nev. D. Ct., Clark County) (the “Nevada Action”). In order to allow the Nevada Action to proceed (because the OpCo Plan was not yet effective at the time), the Reorganized LandCo Debtors had to seek permission from the Bankruptcy Court to lift the automatic stay to permit the Nevada Action to proceed. In certain representations to the Bankruptcy Court during motion practice regarding lifting the stay, counsel for the Reorganized LandCo Debtors supposedly stated that Tropicana LV was not challenging “ownership questions” that were “plainly answered” prepetition and that it was merely seeking to preserve longstanding rights concerning the use of the Tropicana name without a royalty through “a declaration that Tropicana Las Vegas may continue to operate the Tropicana under the Tropicana name without interference by OpCo or payment to them. . . . Just a straightforward request to preserve what we view as our pre­existing right to operate as we’ve always done.” The Bankruptcy Court lifted the stay and allowed the Nevada Action to proceed. The Nevada Action was was subsequently removed to federal court. 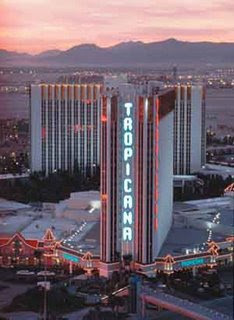 However, as part of a motion to remand the case back to Nevada state court, Tropicana LV argued that they were not challenging ownership of the Tropicana Trademarks, but rather seeking a declaration under Nevada Revised Statute 30.100 that they have a right to use the name that has been associated with that particular hotel/casino in Las Vegas since 1957 based on Nevada state law contract principles and estoppel. Adding fuel to the dispute, on November 18, 2009 – four months after the LandCo Plan’s Effective Date – certain LandCo Debtors filed supplemental schedules of assets and executory contracts, in particular, a property interest in the “name ‘Tropicana’ and the goodwill of the business symbolized by and associated with the name ‘Tropicana’” was listed as an asset and the 1980 Trade Name Agreement was listed as an executory contract. But the apparent final straw was that on January 8, 2010, Tropicana LV moved for summary judgment in the Nevada Action and requested a declaration that Tropicana LV owned the Tropicana Trademarks. The district court in the Nevada Action denied Tropicana LV’s motion for summary judgment finding genuine issues of material fact regarding the Reorganized OpCo Debtors’ status of a bona fide purchase for value which would be a defense to the Tropicana LV’s new claims for damages arising from the use of the Tropicana Trademarks over which Tropicana LV now claimed ownership. Nonetheless, Carl Icahan’s Tropicana Entertainment, Inc. (along with other related companies having interests in the OpCo assets), believing that Tropicana LV’s request for a declaration of ownership from the Nevada Court constituted an improper modification of the Bankruptcy Court’s approved reorganization plans, decided to move the matter back to Delaware Bankruptcy Court with the filing of the most recent lawsuit which seeks various claims for relief to stop the Reorganized LandCo Debtors’ efforts to now claim ownership to the Tropicana Trademarks despite all of the Bankruptcy Court’s Orders. In particular, the Delaware Complaint seeks a declaratory judgment that the Tropicana Trademarks were part of the OpCo Debtors’ assets, a declaratory judgment that the supplement schedules provided by the LandCo Debtors are void, a declaratory judgment that the Nevada Action violated the automatic stay by raising trademark ownership issues in the Nevada Action before the OpCo Plan effective date, a finding that the Reorganized LandCo Debtors’ are in contempt of the court’s Confirmation Order based on the assertions made in the Nevada Action regarding ownership of the Tropicana Trademarks, injunctive relief pursuant to the OpCo Plan and bankruptcy law., a claim for unjust enrichment, and a claim for declaratory relief that, regardless of who owns the Tropicana Trademarks, and the Exit Facility Agent has a valid and perfected security interest in the Tropicana Trademarks for the benefit of the OpCo Exit Facility Lenders. The Nevada Action will likely be stayed pending a determination by the Delaware Court of the status of the conditional assignment right/reversionary interest that appears to have been long forgotten by all of the relevant parties and yet never formally terminated (nor was there any demand for transfer). While Tropicana LV’s claim of ownership to the Tropicana Trademarks by virtue of this conditional assignment right/reversionary interest is an interesting one, this latest attempt to lay claim to the ownership rights is more likely just a means for Tropicana LV to bolster its bargaining position in order to get the relief that it ultimately wants – basically, the ability to continue to use the name Tropicana for the Tropicana Las Vegas without having to pay a license fee. Of course, the fact that Tropicana LV might actually be able to stake a claim of ownership over assets that had an appraised value of approximately $200 million in 2007 could also have something to do with it. LA Triumph also alleges that MGB improperly filed to register the mark MATERIAL GIRL with the United State Patent and Trademark Office (“USPTO”). Interestingly, MGB’s current application (the one cited in the case) was not the first application in line to register the mark MATERIAL GIRL. On May 11, 2009, Audigier Brand Management Group, LLC filed a trademark application for MATERIAL GIRL (covering 7 different classes of goods including clothing). The USPTO initially refused registration in a non-final office action dated August 13, 2009, but only because the description needed some clarification and not based on a Section 2(d) likelihood of confusion refusal. Subsequently, the Audigier application was assigned to MGB on December 1, 2009. And within days of this assignment, MGB then filed its own intent-to-use application for the mark MATERIAL GIRL (for 4 classes of goods including clothing) on December 4, 2009. This explains why MGB did not file a timely response to the PTO’s office action in the “Audigier” application, which went abandoned on March 26, 2010. So why, you ask, would MGB file a new intent-to-use application for MATERIAL GIRL when Audigier’s earlier filed MATERIAL GIRL application had already been assigned to MGB? Most likely because the Audigier application was an intent-to-use application and MGB was not really the successor to any kind of ongoing and existing business by Audigier to which the applied-for mark pertained. Under §10 of the Trademark Act (15 U.S.C. § 1060), an application filed under §1(b) (intent-to-use) may not be assigned before a statement of use has been filed except to a successor to the business of the applicant, or portion thereof, to which the mark pertains, if that business is ongoing and existing. See 15 U.S.C. §1060(a)(1). The law is quite clear that the assignment of a §1(b) application to an entity that is not the successor to the applicant’s business, before filing an allegation of use, renders the application and any resulting registration void. See The Clorox Co. v. Chem. Bank, 40 USPQ2d 1098 (TTAB 1996). By MGB filing a brand new application, MGB could start fresh without having to be concerned about any resulting registration being deemed void on the basis of improper assignment of a §1(b) application. But the real question is this – why didn’t either OC Mercantile or even LA Triumph seek to register the mark MATERIAL GIRL in connection with clothing with the USPTO? While one could speculate that neither company bothered to register because they weren’t actively using the mark on clothing and thus the instant lawsuit would be an attempt by LA Triumph to claim trademark rights that were likely minimal at best and/or long since abandoned, another very likely answer was that the mark could not have been registered by either company with the USPTO because there was already an existing trademark registration for the identical mark for the identical goods. A Canadian company name Les Ventes Universelles S.H. Inc. had a trademark registration for MATERIAL GIRL in connection with clothing (registered July 8, 1997) based on the company’s foreign registration of the same mark (dating back to May 1990). The company filed the necessary Section 8 Declaration of Use at the 5 year mark, but did not renew the mark by the 10 year renewal deadline and the mark was canceled April 12, 2008. So where can I buy LA Triumph’s MATERIAL GIRL clothing again? Bellagio, LLC, the Mirage Resorts Incorporated (“MRI”) subsidiary which owns the Bellagio Hotel & Casino in Las Vegas, has sued Italian mattress maker Magniflex USA, Ltd. (“Magniflex”) in the U.S. District Court for the District of Nevada over Magniflex’s use of the mark BELLAGIO in connection with bed mattresses. See Bellagio LLC et al v. Magniflex USA, Ltd., Case No. 10-cv-01311 (D. Nev. Filed August 4, 2010). A copy of the complaint can be downloaded here (HT: Steve Green). The Las Vegas Sun has coverage of the lawsuit filing and Magniflex’s reaction to the lawsuit. Of course, if Bellagio had been selling such mattresses for all that time, then one wonders why MRI chose to file trademark registration applications on February 3, 2010, for the mark BELLAGIO (word mark and stylized) in connection with “mattresses” on the basis of intent-to-use (as opposed to use-in-commerce). Both applications were provisionally refused registration based on the pending application for the mark BELLAGIO for various furniture goods – which itself was provisionally refused registration based on an existing registration for the mark BELLAGIO LUXURY for future goods. However, the applicant of the BELLAGIO furniture mark recently expressly abandoned its application (after abandoning its effort to cancel the BELLAGIO LUXURY MARK ), so there is nothing likely standing in the way of MRI’s applications moving forward towards publication. Bellagio first became aware of Magniflex’s mattresses at the Spring 2010 High Point Furniture Market in High Point, N.C. Magniflex showcased its Bellagio mattresses again at the bi-annual Las Vegas Market furniture industry event at the World Market Center in Las Vegas. Bellagio alleges in its complaint that Magniflex is selling a line of mattresses using the BELLAGIO mark that is likely to cause confusion with Bellagio’s use of the BELLAGIO mark in connection with its specially made Serta® mattresses. Bellagio also claims that Magniflex’s use of the BELLAGIO mark is likely to cause dilution of Bellagio’s famous BELLAGIO mark under federal trademark dilution law. 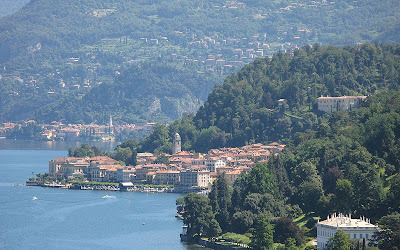 In a statement issued after hearing of the lawsuit, Magniflex’s President Marco Magni stated that its “Bellagio Lavender” line of mattresses were named after the town Bellagio in the Como province in Northern Italy located on Lake Como (which just so happens to have also served as the inspiration for Steve Wynn when he originally built the Bellagio Hotel & Casino). Magni stated that the Bellagio name is meant to pay homage to the Italian city and to be synonymous with fine Italian craftsmanship (Magniflex also maintains that it is one of Italy’s largest mattress manufacturers and sells its products throughout the world). Bellagio’s causes of action are for federal trademark infringement, federal trademark dilution, federal unfair competition, and common law unfair competition. 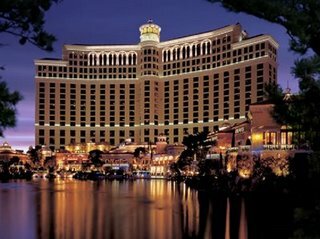 Bellagio seeks injunctive relief as well as damages, costs, and attorneys fees. There has been a lot of discussion in the Las Vegas area (and nationwide) about the numerous copyright infringement lawsuits filed by a Las Vegas company named Righthaven, LLC. As of August 4, 2010, Righthaven had filed approximately 86 lawsuits against various website operators claiming copyright infringement. While not immediate apparent from the lawsuits, Righthaven is essentially a company established by Stephens Media LLC, the owner of numerous newspaper including the Las Vegas Review Journal (the “RJ”), in order to go after any and all third party websites that improperly excerpt all or part of the copyrighted articles from the RJ. Many people who post content online may be under the impression that they can lawfully post all or part of an article originally published in the RJ so long as appropriate credit to the RJ is given (as well as possibly a link back to where the article appeared on the RJ’s website). In actuality, such actions may constitute copyright infringement. The RJ just accepted this type of copyright infringement for the longest time as an unfortunate byproduct of the Internet. However, earlier this year, the RJ apparently had a change of heart and is now aggressively going after anybody who posts any of its copyrighted content online. A blog posting by Sherman Frederick, the publisher of the RJ, posted in May 2010 explained the RJ’s new aggressive actions towards reposting of the RJ’s copyrighted content. We grubstaked and contracted with a company called Righthaven. It's a local technology company whose only job is to protect copyrighted content. It is our primary hope that Righthaven will stop people from stealing our stuff. It is our secondary hope, if Righthaven shows continued success, that it will find other clients looking for a solution to the theft of copyrighted material. To describe Righthaven as a “technology company” is probably a glamorization of what is essentially a company more akin to a law firm established by the RJ to be the assignee of various copyrighted articles so that Righthaven can obtain copyright registrations on such articles and then file lawsuits in federal court for copyright infringement. By establishing a separate company, not only can the RJ keep a distance from and avoid being associated directly with the aggressive tactics of Righthaven, it can also have what is (most likely) a law firm working on a contingency basis based on all of the settlement amounts obtained from the unsuspecting website operators who find themselves looking at either paying a quick nuisance settlement or spending thousands of dollars of legal fees defending what may possibly be fair use, but what is more likely than not a clear cut case of copyright infringement (albeit unintentional on the part of the person who just wanted to cite to one of the RJ’s articles). And even in those cases where the articles were posted by third parties under circumstances where the website operator may be immune under the Digital Millennium Copyright Act (“DMCA”), it still often makes more sense to just give into Righthaven’s demands than to pay the cost to prove that no liability exists. Righthaven’s agenda to obtain quick and easy cash settlements (in addition to having its copyrighted content taken down from those posting without permission) is clear by the fact that Righthaven never contacts any of these websites and orders them to take down the infringing content nor sends any kind of cease and desist letter to takedown request against the website. Of course, Righthaven is under no obligation to do so, but at the same time, if such letters were sent out (something that apparently, rival newspaper company Greenspun Media does with much success), then Righthaven knows that the website operators are likely to quickly comply and take down the content – without Righthaven getting any “compensation” for the use of its articles (or compensation to offset the time and effort for sending out such notices). Instead, the party is immediately named as a defendant in a lawsuit (which only costs $350 to file, not including the time it might take for a paralegal to modify Righthaven’s boilerplate legal complaint to the facts and circumstances of each case), which puts the named defendant in the serious situation of having to spend time and money addressing these allegations or else face a default judgment by the court. Rather than fight against Righthaven and obtain what is at best likely to be pyrrhic victory, most defendants will choose to just settle. Some may be asking how the RJ can claim a copyright over the news that it covers. While the RJ cannot claim copyright rights over news events, it can claim a copyright to the particular way that one of its employed writers describes a news event. Accordingly, while you can describe a particular news event on your website that you may have read about in the RJ, you cannot describe such news by using the precise copyrighted written text that the RJ used to describe the news. And while copyright law does protect certain uses of a copyrighted work as “fair use,” such as when a work is reproduced for purposes of criticism, comment, news reporting, teaching, scholarship, and research, whether a particular use constitutes “fair use” actually involves an analysis of several factors used by courts including the purpose and character of the use (whether use is commercial or for nonprofit purposes), the nature of the copyrighted work, the amount and substantiality of the portion used in relation to the copyrighted work as a whole, and the effect of the use upon the potential market for or value of the copyrighted work. See 17 U.S.C. §107. 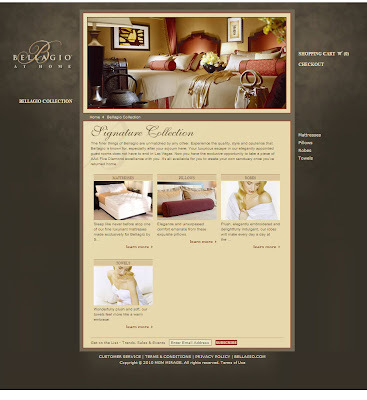 One factor often overlooked by many website operators is the commercial nature of their websites. Think your website is non-commercial? – well, if you have pay-per-click ads being displayed on your website and you are generating some revenue from the website, then your website is more commercial than you think. So what is a website to do in order to avoid the “wrath” of Righthaven if you want to mention an RJ news article on your website? While there is nothing clearly outlined on the RJ’s own website, Mark Hinueber, the Vice President and General Counsel for Stephens Media, recently provided some guidance for third parties regarding how to properly cite review journal articles. Mr. Hinueber is informing interested parties that the appropriate procedure for using stories published in the RJ (and any other publication owned by Stephens Media) is to post the headline of the story and then the first paragraph with a link to the original story. Accordingly, if you wish to quote from an RJ story on your website – and you do not otherwise obtain a non-exclusive license from the RJ to post all or part of the story on your website – then you should post only the headline, the first paragraph of the story, and a link to the RJ’s website where the original story can be found. A 1.5 percent pay cut by all 38,500 employees in the Clark County School District would prevent layoffs and resolve the budget crisis for the 2010-11 school year, according to a proposal from the union representing school principals and administrators. For those website owners that are not actively involved in posting content, but which maintain a website which allows third parties to post content to online forums, then you need to confirm that you have taken the proper steps to ensure that your website is immune from any claims for damages for copyright infringement under the safe harbor provisions of the DMCA. The DMCA safe harbor provisions require a copyright owner to first give notice to the website owner that copyrighted content appears on its website and an opportunity to take down the material before proceeding with a lawsuit. Many website owners may be under the impression that they are protected by the DMCA when in reality, there are very specific requirements must be met before a website owner can invoke the DMCA safe harbor provisions. See 17 U.S.C. §512(c). In particular, the safe harbor only applies to service providers who have designated an agent to receive notifications of claimed infringement and providing information about the agent (name, address, phone number, and electronic mail address of the agent) to the Register of Copyrights, which maintains a directory of agents available for publication inspection. See 17 U.S.C. §512(c)(2). This list can be viewed here. Once you have designated the proper agent, if a user to your website posts an RJ article that infringes the RJ’s or Righthaven’s copyright rights, then the RJ or Righthaven must provide you with the proper takedown notice and allow the website owner to remove the infringing content before proceeding with litigation. Righthaven has likely been targeting those websites where either the website owner directly posted the RJ’s article or, to the extent a third party may have posted the article, then the website did not have an agent designated to receive notification of claimed infringement, and thus cannot invoke the DMCA safe harbor. (Indeed, some of the more recent complaints filed by Righthaven include factual allegations about the Defendants not instituting any proactive policy intending to address the posting by others of copyright-infringing content). For those that have to date flown under the Righthaven radar, you can begin taking immediate steps to avoid facing any kind of copyright infringement liability. However, if you are the unfortunate recipient of a notice that a lawsuit has been filed against you by Righthaven for copyright infringement, you should take the matter seriously and immediately consult with legal counsel familiar with copyright law and with Righthaven. If you choose not to respond to the complaint, you could face a default judgment being rendered against you by the court that could go as high as $150,000 per infringement. To date, I have not written anything on this blog about Righthaven LLC, the so-called start-up company in Las Vegas that has garnered much nationwide attention for filing a slew of copyright infringement lawsuits in Nevada U.S. District Court against websites posting Las Vegas Review Journal stories. The lack of any coverage on my part was mostly due to my deliberate choice to make this blog strictly about trademarks; but like most intellectual property attorneys in Las Vegas, I am well aware of the name Righthaven. Nevertheless, a group of articles published today by Steve Green with the Las Vegas Sun compels me to break with my blogging tradition in order to spotlight these articles (published in the LVRJ’s competitor paper) which provide a detailed report of Righthaven’s actions from all points of view (and not just because one of the articles includes a quote from yours truly). Are website copyright violations hurting newspapers’ bottom line? Having taken the plunge into discussing copyrights on this blog and specifically about Righthaven, I hope to post my own article that I’ve written about Righthaven within the next day or so. This is the sad (but probably all too common) story of one individual’s attempt to seek justice in our courts only to be smacked in the face with the reality of how our legal system really works. In this case, Goliath not only defeated David, but also obtained possession of a valuable internet domain name in the process leaving David with nothing. The David in this case is California resident Ronnie Katzin (“Katzin”) and the Goliath in this case is New York-New York Hotel & Casino, LLC (“NY-NY”), the company which owns the New York New York Hotel & Casino in Las Vegas. On November 6, 2009, NY-NY filed a cybersquatting and trademark infringement lawsuit against Katzin and his wholly-owned corporation, NewYorkNewYork.com, Inc., regarding the domain name newyorknewyork.com (the “Domain Name”). See New York-New York Hotel & Casino, LLC v. Katzin et al, Case No. 09-cv-02139 (D. Nev. November 6, 2009). Complaint here (via Las Vegas Sun). I previously blogged about this lawsuit here. I think it’s clear from the tone of my original post that I believed this lawsuit to be a clear cut case of NY-NY overreaching and using weak claims of trademark infringement and cybersquatting in order to reverse hijack the very valuable domain name newyorknewyork.com for NY-NY’s own business purposes. While the allegations in the complaint sounded pretty egregious and straightforward, one must always keep in mind that almost anything can be stated in allegations set forth in a legal complaint – it does not mean that such allegations are automatically true (and indeed that’s what trials are all about – a jury or judge determining what are the true facts of a case based on evidence). What’s even more unbelievable is the single event that seemed to give NY-NY the “hook” for making its claims against Katzin after all this time. 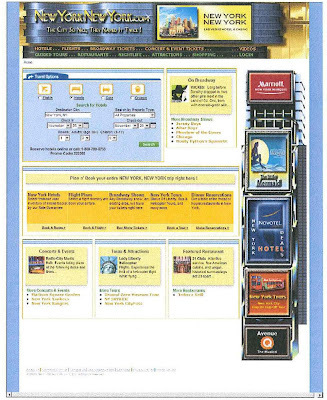 The website that Katzin was running at the Domain Name was a basic travel-type site that allowed visitors to make reservations to various hotels, restaurants, entertainment attractions located, where else, in New York, New York. 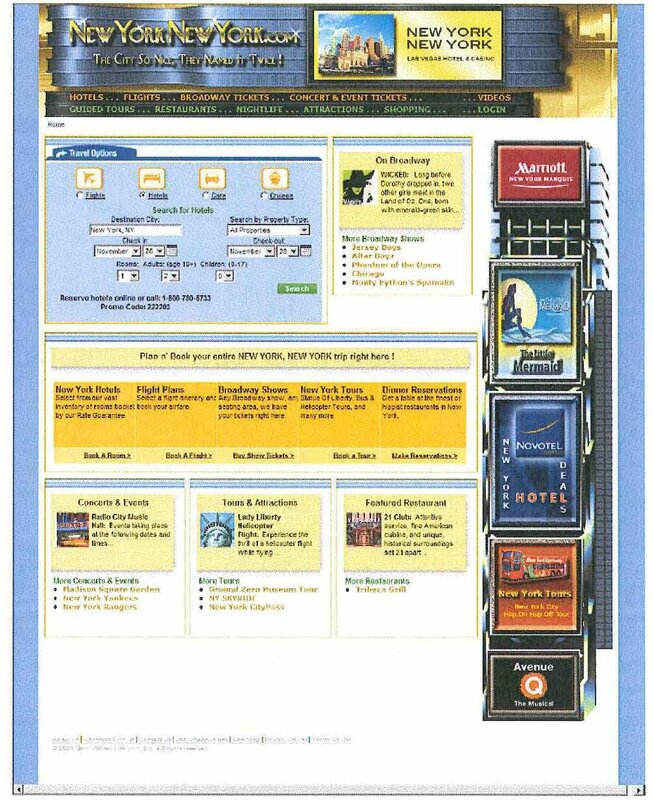 Unfortunately, as part of that website, Katzin put up a banner ad which displayed “New York-New York Hotel & Casino” and which visitors to the Domain Name could click on and make reservations to that hotel or possibly other hotels in the Las Vegas. 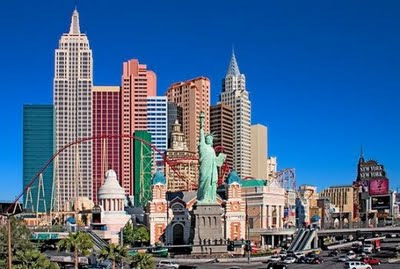 According to Katzin (in a statement he made to the Las Vegas Sun), this image linked to a room-booking website operated by Expedia's Interactive Affiliate Network, which has a deal to sell MGM Mirage rooms (NY-NY is part of MGM Mirage). This single banner ad (pictured below) that probably only ran for a short period of time gave NY-NY the hook that it had probably been looking for to file a cybersquatting complaint against Katzin and his corporation. Is this trademark infringement? Maybe, but only for minor damages and nothing that can’t be remedied through a court injunction and certainly not deserving of a court order turning over such a valuable domain name. Is this cybersquatting? Only if you believe that Katzin registered the Domain Name all those many years ago before New York-New York Hotel & Casino had even opened (and could make any claim for acquired distinctiveness), waited nearly 15 years, and then through the posting of a single banner ad in a larger website that had nothing to do with New York-New York Hotel & Casino is engaging in bad faith use of the Domain Name such that Katzin should be labeled as a cybersquatter. Unfortunately for Katzin, the WHOIS registration information for the Domain Name reflected that the corporation was the registrant of the Domain Name, which is why the corporation was named as a co-Defendant in the case. While some of the filings show that Katzin represented himself in this case, he could not represent the corporation before the court since Katzin is not a licensed attorney. Without legal representation, NY-NY was able to obtain a default against the corporation and requested a default judgment against the corporation. A review of some documents filed by Katzin in the case do raise some questions regarding ownership of the Domain Name (issues of fact that should’ve been decided by a factfinder). While the corporation may have been listed as the registrant on the WHOIS database, I would argue (and indeed I have argued albeit somewhat unsuccessfully) that WHOIS cannot be relied upon for determining ownership to a particular domain name. There was also some evidence that Mr. Katzin may have even had a written license agreement with the corporation for the corporation to use the domain name – which would suggest that Katzin was indeed the true owner of the Domain Name despite what was reflected in WHOIS. But none of that mattered unfortunately because Katzin apparently could not afford to hire legal counsel to represent the corporation in this matter. And last week, U.S. District Court Judge Lloyd George awarded NYNY the Domain Name by virtue of a default judgment against the corporation – the purported owner of the domain name. A copy of the court’s order is available here. The Domain Name was apparently transferred the very day the court entered its order (an order that was drafted by NY-NY and merely signed off on by the court). The cybersquatting statute was meant to stop bad faith registration of domain names and bad faith use of a domain – it was not mean to be used as a tool by large businesses to obtain possession of domain names that they feel rightfully belong to them from someone who was lucky enough to buy a valuable domain name during the infancy of the internet and who had been holding onto such domain name and making actual good faith use of the name separate and apart from its meaning as a designator of a Las Vegas hotel and casino [that’s right – New York New York does have another highly recognized meaning out there that has nothing to do with NY-NY's hotel/casino]. Instead, the ACPA has become a tool to allow trademark owners like NY-NY to hijack domain names that they would like to have as part of their asset portfolio under the guise of cybersquatting and trademark infringement claims. Based on what I saw from court filings, there was no evidence in the case that the Domain Name had ever once relied upon the goodwill of NY-NY other than the aforementioned banner ad – an action that could’ve easily been redressed with a cease and desist letter. [There were some other interesting facts in this case involving the Domain Name also being hijacked from Katzin in 2004 (during which time it may have been improperly used, but not by Katzin) – only to be returned in 2006 after the FBI discovered the large scale theft of domain names by a company named True Magic – but that’s outside the scope of this post (and touched upon briefly in my prior blog posting).] Of course, NY-NY didn’t want Katzin to cease and desist from using the banner ad on the website – NY-NY wanted the Domain Name, plain and simple. While NY-NY may have had a real cause for complaint regarding trademark infringement because of this banner ad , this was not cybersquatting and did not merit the handing over to NY-NY of the Domain Name. This was a successful domain name hijacking, plain and simple. And all because a business entity must be represented in court by legal counsel and legal complaints that go unanswered are deemed true regardless of what kind of fatuous allegations are stated therein and despite the existence of other evidence that raises serious issues of fact regarding such factual allegations. While the case technically moves on because NY-NY sued both the corporation and Katzin personally, and the default judgment was only against the corporation and not Katzin, now that NY-NY has what it really wanted all along (along with a $100,000 cherry on top), I would suspect that NY-NY might simply voluntarily dismiss its claims against Katzin individually so that the judgment against the corporation can be made final.